COMPETITION promises to be close in the Haslem Sheppard Halifax AFL’s Premier Division this season if Friday’s opening four games are anything to go by. Midgley United, Copley United and Greetland all won by single-goal margins while Calder ‘76 and Sowerby Bridge fought out a 2-2 draw. Midgley won a home Calder Valley derby with Hebden Royd Red Star in front of a three-figure attendance on a warm evening. George Bamford gave Midgley with lead with a back post header after 20 minutes but Lewis Cockroft equalised 10 minutes after the break after home keeper James Brook had parried the ball away. Rob Stansfield headed what turned out to be the winner from an excellent cross by Ryan Jeffreys 10 minutes later. In a largely scrappy contest, Brook made four good saves in the second half to deny Red Star. Trying to retain the Challenge Cup could be the main target for Greetland, who nevertheless opened with a 3-2 home win over Ryburn United courtesy of Bailey Dunne, Tom Wall and an own goal. Nathan Hargreaves and Christian Silkstone replied. Champions Shelf FC were without a game and will have been encouraged that two of the teams boss Matthew Till had nominated as major threats, Sowerby Bridge and Shelf United, dropped points. County Trophy holders Bridge were held 2-2 away to Calder ‘76 while Shelf suffered a surprise loss to last season’s Division One runners-up Copley United. Calder took the lead after 20 minutes when Ben Oldfield released Max Crossley, who slotted the ball through keeper Bailey Fulton’s legs. Bridge came back in the last 15 minutes of the half with Andrew Markham and Adam Barlow to the fore but solid defending from George Hampshire and Kieran Simm kept them out and Steve Jones’s lob at the other end somehow managed to hit the bar twice before the ball went out for a goal kick. In the second half Bridge started the more livelier but were hit on the break and a pin point Oldfield cross from the right was heading home by Jones to make it 2-0. Bridge kept pushing but were running out of time. Damien Watkins saw a goal disallowed and a point blank header come back of the bar but with 15 minutes remaining man of the match Sam Hiley created space brilliantly and when his shot was only parried by goalkeeper Matthew Senior, Watkins was on hand to force the ball home. With five minutes remaining Joel Cleary and Lee Wood worked the ball into the path of Tom Hiley, who steered home the equaliser. Lee Worrall and Gary Ash were on target for a Copley side returning to the Premier after failing to win a game in the section in 2016-17. Billy Grogan’s reply was insufficient for Shelf United. THREE of the new arrivals got off to flying starts in Division One on Saturday. The biggest winners were promoted St Columba’s, who thrashed hosts Holmfield 9-2 on an overgrown pitch at Natty Lane. Andy Sandells drilled in their opener and man of the match Kutubo Touray doubled the lead shortly afterwards. Holmfield pulled one back following a long clearance by their keeper but Saints powered into a 6-1 interval lead. Young striker Macauley Mountain curled an effort into the bottom corner; Touray rounded the keeper after being sent clear by the impressive James Stansfield; Mountain added his second; and wing back George Cook added to the tally. Holmfield started the second half with more purpose and aggression but it didn’t take Saints long to regain control. Veteran striker Frank Odion slotted home and Mountain completed his first senior hat-trick. 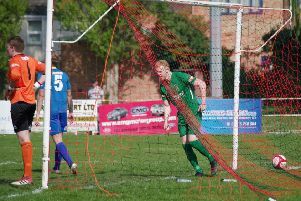 Holmfield got a second from the penalty spot before Scott Holmes had the last word for Saints. Northowram, down from the Premier Division in the close-season league reshuffle, won 6-1 away to last season’s Division Two champions Plummet Line. The late summer sunshine was more enjoyable than the first 45 minutes at Savile Park and even though the Rams took an early lead with a penalty from impressive newcomer Craig Collins after Billy Farrell’s tricky run, Luke Sharman’s bullet half-volleyed equaliser after 17 minutes was distinctly out of keeping with the mundane fare on offer. A horrible mis-kick left Farrell with the easiest of chances from close range to put the Rams ahead on the stroke of half-time. Cue a second half transformation and once Matty Long had extended the lead after 53 minutes from Collins’ hanging corner kick the Rams dominated. Goals from Jake Baker and Matt Calland put the game out of reach of an increasingly ragged Plummet Line. Baker made it six with 20 minutes left and Collins’ low shot from distance shaved a post before Plummet missed their one clear chance of the half. The section’s one close match of the day was at Greetland Community Centre where hosts Elland Allstars beat Salem 2-1 with Luke Simmonds’ goal in vain for the visitors. TWO GOALS each for Andy Hawker and Josh King plus one from Kyle Peel gave Shelf FC Reserves a 5-0 win away to Flying Dutchman at Savile Park in Saturday’s only Division Three contest.